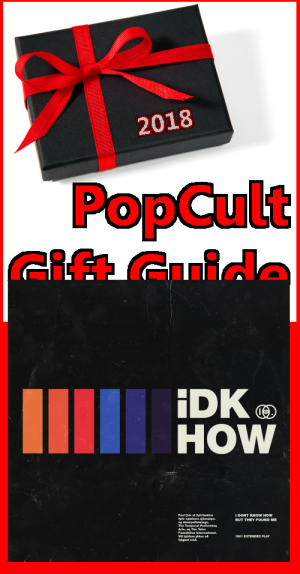 Today’s first pick in The 2018 PopCult Gift Guide is the debut EP by a new band (that’s actually been together for a few years), I Don’t Know How They Found Me But They Did, a duo consisting of Dallon Weekes of Panic At The Disco and Ryan Seaman. formerly of the band Falling In Reverse. Some folks shorten their name to IDKHOW. You might want to remember it. These guys could be the biggest band of the 1980s! The band caught my eyes and ears with the single, “Do It All The Time,” which you can see at the bottom of this post. As you can tell, this tune occupies a sonic space displaced in time somewhere between DEVO and The Buggles, circa 1980. Aside from the strong New Wave influence, the band also shows off a familiarity with “Nuggets” style garage rock, grunge, glam and BritPop…all things that make your PopCulteer’s ears perk up. I Don’t Know How They Found Me, But They Did released “1981: Extended Play” just a couple of weeks ago, and you ought to be able to find it at any store that sells new music, or take the easy route and hit up Amazon. It’s six great songs for eight bucks. Can’t go wrong with that. You can even get it on vinyl and cassette, directly from the band’s website. It’s the perfect gift for the hip retro musicologist on your holiday shopping list. But first, check out the video and see if it tickles your fancy.